This is what I do when hanging with my friends during our free time. I hope I didn't messed up with this N'Sync song LoL!. No cover ups. No frills. Just a bigger and better promise of the good old, cheesy and giant S&R Pizza delivering to most parts of Metro manila. Yes, we’ve heard it before, the long lines are making you drool over your favorite S&R New York Style Pizza even more. And though it is definitely worth the wait, some of us may not just have the time and especially the patience to do it. Fret no more because S&R recently joined the long list of foodpanda’s restaurant partners making their in demand, enormous pizzas available even in the farthest corners of the Metro. How about Churros for your Next Online Food Delivery? THIS IS NOT A DRILL!! Craving for your favorite churros, but don’t have the will and time to brave the chaos outside? La Lola is now available via foodpanda desktop site and mobile app to serve you happy, messy, and chocolatey smiles! 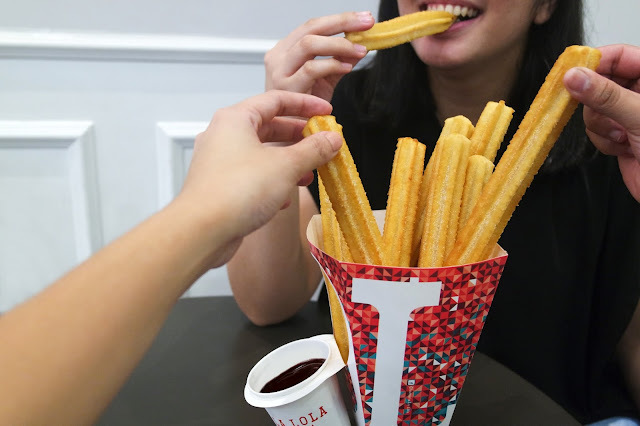 Since their launch in 2014, La Lola Group has been consistently giving us several Spanish concepts to go loco about, and their churros are definitely not an exemption to this. They played and had fun with the traditional style of serving churros, and introduced a whole new way of appreciating this epic snack-time rock star. Press Release: Atlanta,Ga., June 1, 2018 -- MaxBox VR, the leading manufacturer of branded VR headsets, announced today that it sold a total of one million virtual reality headsets in 2017. The company offers an innovative marketing experience to companies all across the globe through their VR cardboard creations. Since 2014, Maxbox VR have been working hard to make brands and businesses worth remembering in the new digital age, while establishing themselves as THE brand for cardboard VR headsets. Maxbox VR is the secret force behind most of the VR marketing campaigns that you most likely encountered at launch events for companies such as Microsoft, Nestle, Nike, Krispy Kreme, Snapchat and Google. Google Streetview has chosen Maxbox VR as the go-to for VR cardboard. Visit Google Streetview partners to learn more.